and Ground you should be able to move through this phase with some semblance of grace. As I write this, I have just walked the labyrinth. Yom Kippur is tonight. Autumnal equinox will be just after midnight, local time. Sunday brings an eclipse and Full Moon. Mercury is in retrograde (see sidebar), as are Uranus, Neptune, and Pluto. It is a time for reflection and introspection, a time to reassess what I'm doing and where I'm going, at least in part by looking at how I got here. It is a time for peering into the shadows of the subconscious and letting intuition take the lead. Not coincidentally, I find myself working with a new guide, who is prompting me to be more outspoken about issues that may make people uncomfortable. We'll see how that goes. I am finishing up a business plan to build a retreat on Maui, and that endeavor is going to require a substantial amount of focus. 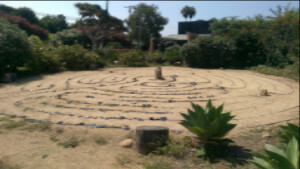 I am leading a project to build a labyrinth as a shamanic initiation tool near the Salton Sea. We hope to start our build in January, and that is going to take some of my attention as well. And I have been called to write a new book about transforming the energy on the Internet to create real change in the world. Once I get it a little more hammered out, I may be shopping it around to major publishers, rather than self-publishing. We'll see. Regardless, this is also going to use up a lot of creativity, time, and energy. So I won't be developing any new classes, although I will certainly still be teaching. I have already pulled back from offering psychic readings and will only be available on rare occasions. And I will not be joining or starting any new projects until all three of these have wrapped. It's important that I not spread myself too thinly. What commitments are you ready to make to yourself? How will you take charge of your energy? What steps do you need to take in order to manifest your vision? Copyright © 2015 Ayamanatara, All rights reserved. we will be able to send you special offers for your birthday. In case you like that sort of thing.